A sports enthusiast for half his life, Tobias has a strong history in journalism, communication and public relations. As Press & Public Relations Director, he heads the media department of the world’s leading strategic forum for global health – the World Health Summit (WHS). In this position he creates strong multi-stakeholder-relationships with international Ministries, Nobel Prize laureates, leading pharma and tech companies, NGOs, research institutions, and media outlets. He is editor-in-chief of the yearly WHS Yearbook which has been honored with several awards for content and layout. 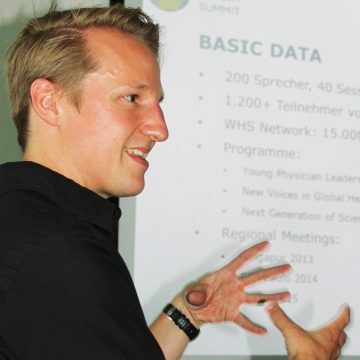 In 2012, he founded an annual award for young science journalists, and is responsible for curating the WHS Startup Track. Outside the office he can be found at Germany’s major bike races, doing medium or long distance runs, or teaching martial arts. Among his most cherished milestones are winning the Ironman 70.3 Barcelona Mixed Relay, interviewing Rammstein and privately discussing the history of computers with Nobel Prize laureate Barry Marshall. He holds a university degree (Magister Artium) in Philosophy, English and History.